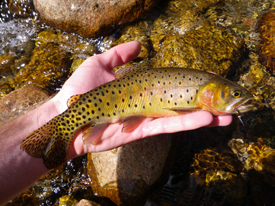 A Greenback from a high altitude stream in Colorado. 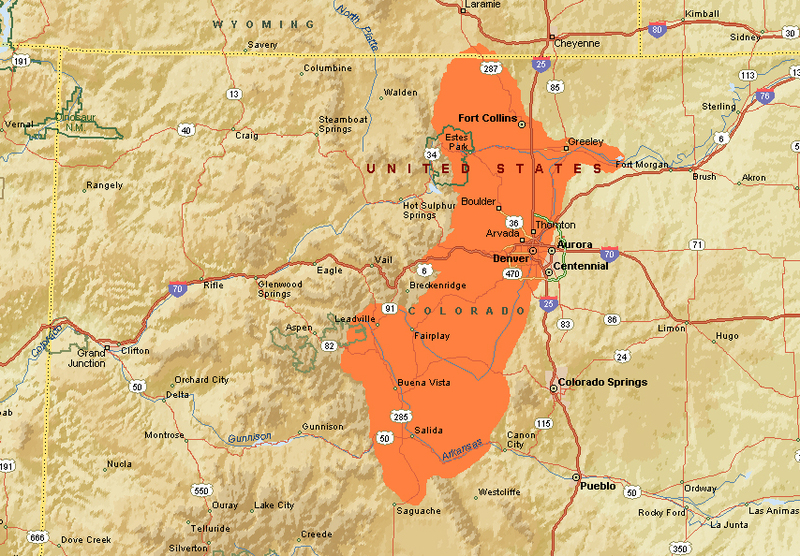 The greenback cutthroat is a minor subspecies of the Yellowstone cutthroat that is thought to be most directly derived from the Colorado River cutthroat. Like the Colorado River cutthroat these trout are known for being extremely colorful and are commonly considered to be one of the most beautiful trout in North America. Greenbacks are native to the eastern side of the continental divide in the Arkansas and South Platte River drainages of Colorado and a small part of Wyoming. The greenback cutthroat are very susceptible to environmental alternations and have suffered major declines since the arrival of Euro-Americans within their native range. In fact between the 1930's and 1960's they were thought to be extinct, however since then several small isolated population have been "rediscovered" and recovery efforts are underway. The greenback cutthroat historically occurred as stream resident, fluvial and lacustrine populations. 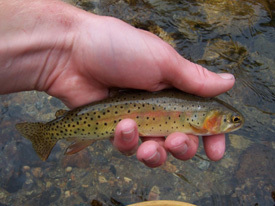 However all of the native fluvial populations have since been lost and very little is known about them, although it is assumed that they exhibited similar traits to those of other interior cutthroat subspecies. With the arrival of Euro-Americans in the greenback's native range the only populations that persisted were in a handful of small remote headwater streams and it is from these that the current translocated stream and lake populations came from. Today the lacustrine life history form is only found in a handful of relatively small mountain lakes, however they were once found in a number of lakes and ponds across their native range. The only truly large lake that these fish inhabited though, was Twin Lakes near Leadville Colorado. It was here the that coexisted with the yellowfin cutthroat (extinct) by utilizing different food items. The greenbacks in Twin Lakes had a diet consisting of insects and never reached sizes much larger than 10 or 12 inches (Trotter 2008). The yellowfin cutthroat however filled a different habitat niche being piscivorous and feeding on the smaller greenback cutthroat, which allowed it to reach weights of up to ten pounds. Overall this relatively small size for greenback cutthroat seems to be a relatively common trait, although some lake dwelling greenbacks have been known to grow to sizes of up to 20 inches. These lacustrine cutthroat spawn in either the inlet or outlet stream of the lake that they inhabit, depending on the quality of the habitat. 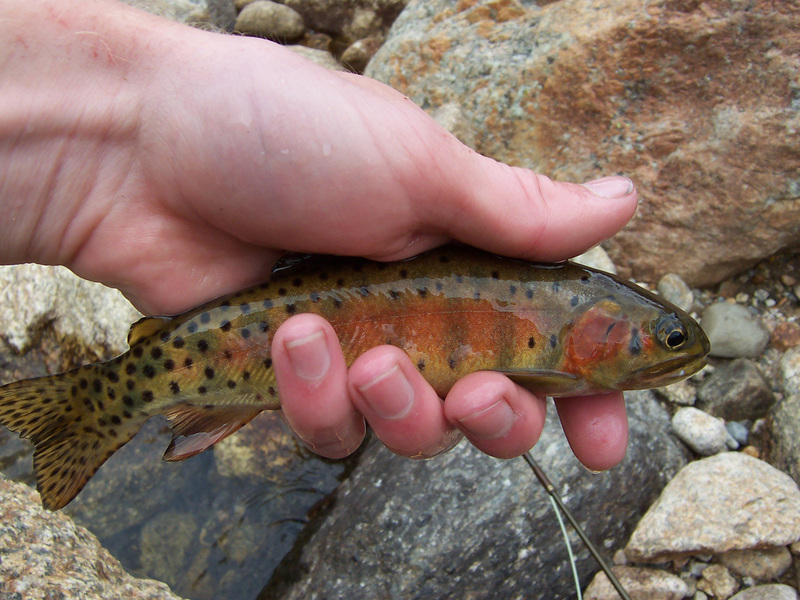 The bulk of the greenback cutthroat populations today occur as the stream resident life history form. For the most part stream resident populations of greenbacks have a similar life history when compared to other interior cutthroat subspecies, being spring spawners and generalists in their feeding habits, however there are some unique factors attributed to these fish. Like other cutthroat subspecies the greenbacks are spring spawning fish however at elevations of over 10,000 feet this often means that spawning will be occurring in late July or even early August. 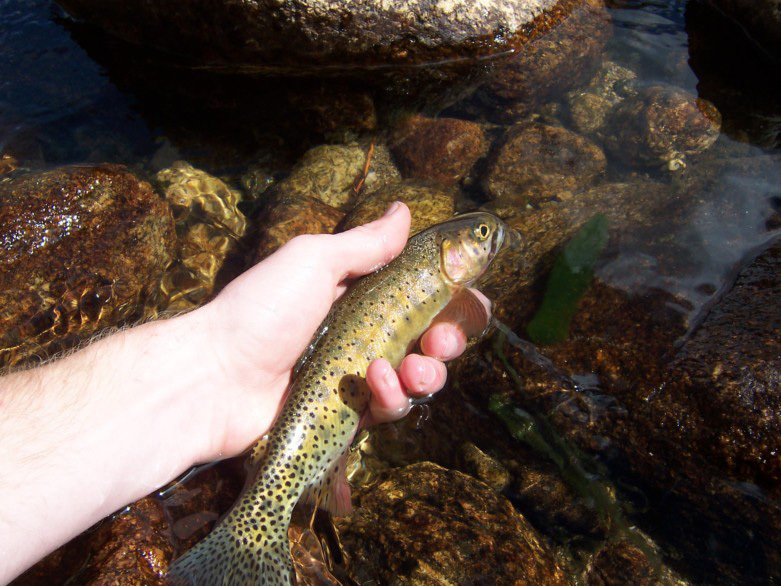 With the late spawning time and short growing season, greenbacks also have the quickest hatching eggs of any western trout, with there eggs often hatching a we before rainbow trout (Behnke 2002). However according to Coleman and Fausch (2007) fry survival is greatly influenced by stream temperature and colder, higher altitude streams tended to have lower fry survival. Like lacustrine fish, those in stream resident populations are not known for especially large sizes, with the average fish being 8 to 10 inches and the maximum size at around 18 inches. The Greenback cutthroat came very close to sinking into the void of extinction, but thanks to several decades of restoration efforts they once again swim in many of their native waters. The great decline of these trout came from a number of sources, including the introduction of nonnative trout, overfishing and habitat destruction. Perhaps the most detrimental impact on the Greenback cutthroat was the introduction of nonnative trout. 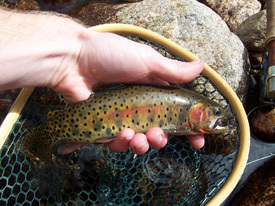 With the exception of the Twin Lakes population which coexisted with the now extinct Yellowfin cutthroat, greenbacks had no interaction of other trout species, making them susceptible to hybridization with rainbow trout and other cutthroat subspecies and replacement by competition. Wang and White (1994) showed that when in a stream environment together brown trout are much more aggressive than greenbacks and in fact brown trout would exhibit dominance over greenbacks that were as much as 1.3 times longer and 1.7 times heavier than brown trout. This behavior forces the cutthroat out of the more favorable habitat and into marginal habitat where they are much more susceptible to predation and even starvation. Similarly brook trout also displace greenbacks, but it is thought that this is more due to mortality of greenback eggs and juveniles in the presence of brook trout (McGrath and Lewis 2007). Perhaps worst than displacement by these two species was hybridization with the rainbow trout which also spawns during spring and results in a loss of greenback populations via swamping with rainbow trout genes. 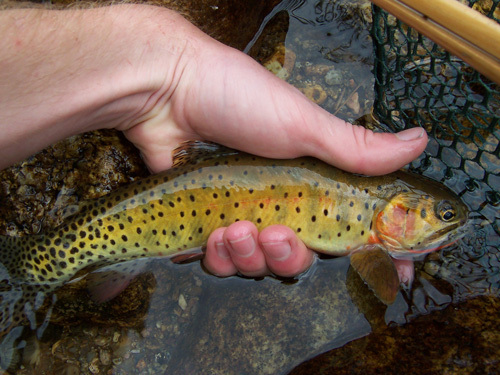 Beyond the issues with nonnative trout, over-fishing has also been an issue. Greenback cutthroat are among the most susceptible trout to angling pressure and can be fished out much more quickly than rainbow, brook or brown trout (Behnke 1992). Habitat destruction has also been an issue for these fish and mining has been especially detrimental leading to destroyed stream habitat and elevated levels of heavy metals. Another issue facing these fish in light of an increasingly industrialized environment has been acid deposition (acid rain) and lowered stream pH levels. Woodward et al. (1991) showed that the alevin stage of these cutthroat is the most susceptible and at a pH of 5.0 there was a 68% decrease in survival. These are just a few examples of the many issues that led to the massive decline of these fish across their native range. The combination of these factors resulted in the greenback disappearing from nearly all of its native range by the 1930's and in 1937, these fish were declared extinct. However a few pure populations persisted in a handful of small remote headwater streams above barrier falls and set the stage for the "rediscovery" of these trout in the 1960's. 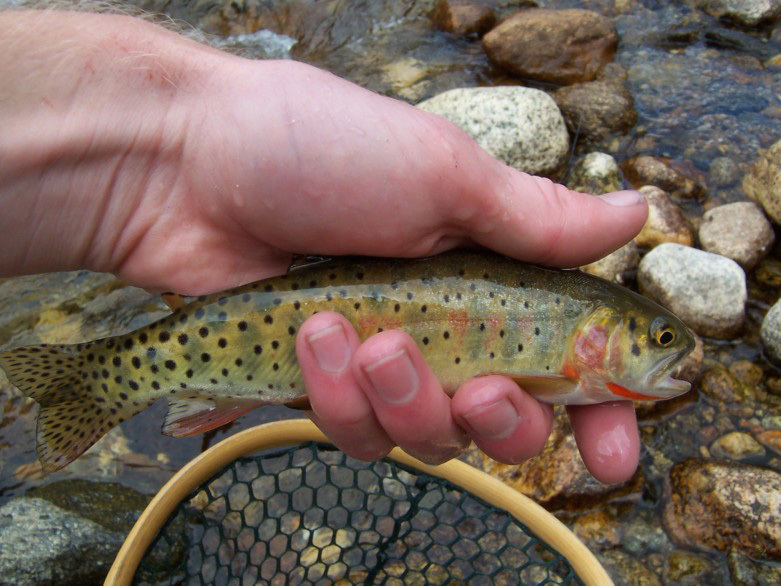 With only a handful of native populations remaining, in 1973 the greenback cutthroat were listed under the Endangered Species Act (ESA) and restoration efforts began. 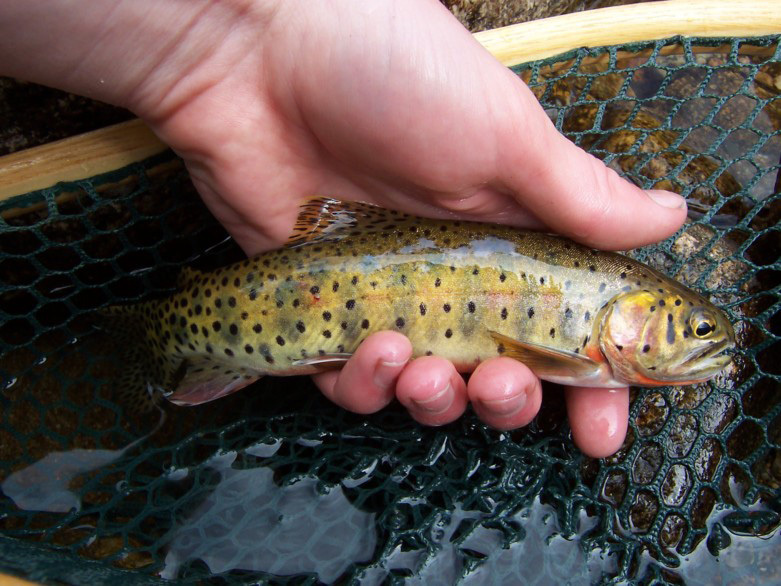 The projects required that nonnative trout were first eradicated, then pure greenback cutthroat would be restocked into the stream or lake in question. However a number of projects have failed because a handful of nonnatives survived and within a few years displaced the greenbacks again (Trotter 2008). Harig et al. (2000) showed that 48% of all failed greenback cutthroat restoration projects have been due to re-invasion by nonnative salmonids. 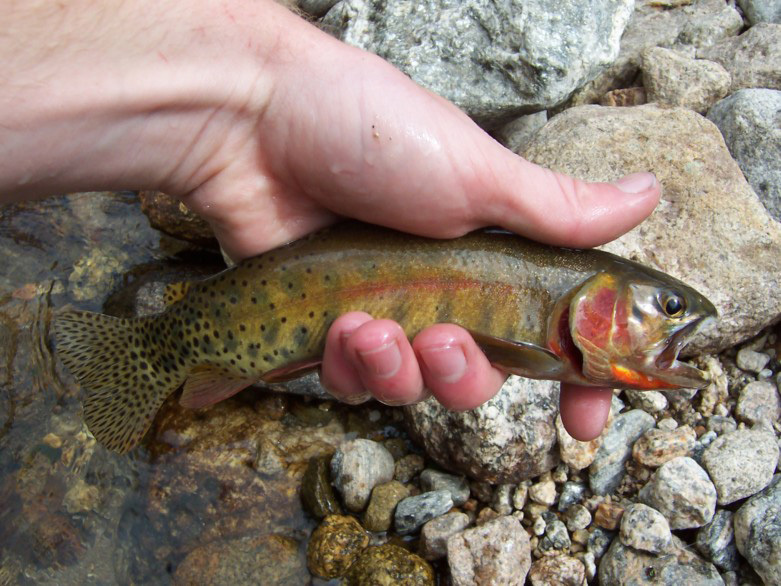 However there have been a number of successful reintroductions and today there are about 60 different transplanted populations of greenback cutthroat, with many occurring in lakes and streams in Rocky Mountain National Park. The restoration of the greenback cutthroat was proceeding according to plan and being heralded as a success story until 2007 when a bump in the road was hit. 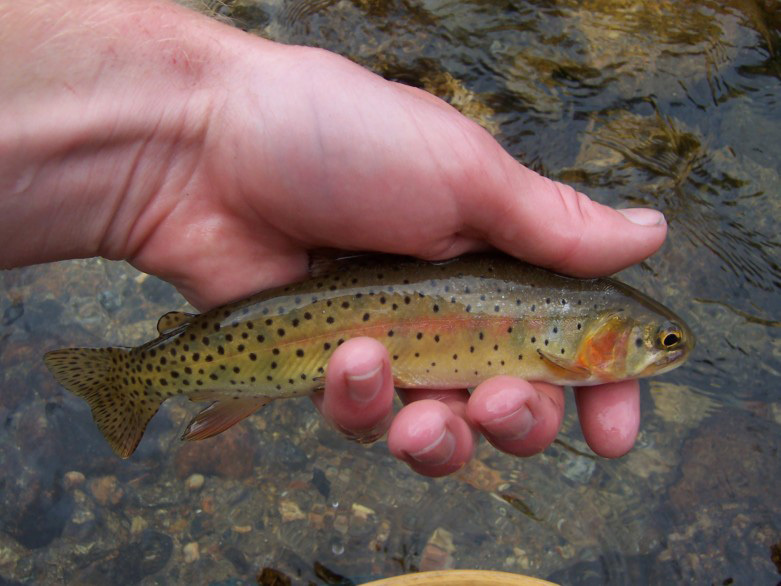 This came in the form of a genetics study that indicated that many of the restored greenback cutthroat populations had in fact been stocked with Colorado River cutthroat (Metcalf et al. 2007). However Dr. Behnke points out that genetic analysis is open to interpretation and when a widespread subspecies like the greenback is fragmented into tiny isolated populations genetic analysis will produce uncertain results (Behnke 2007). Hopefully the agencies in charge of the restoration project will be able to sort out these confusing results and get the ball rolling on the project once again. 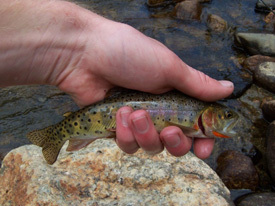 The appearance of the greenback cutthroat is rather similar to that of the Colorado River cutthroat, with individuals often displaying an intense coloration along their sides. The greenback cutthroat generally have an olive color on their backs, which transitions to a brilliant greenish yellow along their sides. They also exhibit a pink to red color along their lateral line and on their gill plates and will often have an orange color present along their belly as spawning approaches. 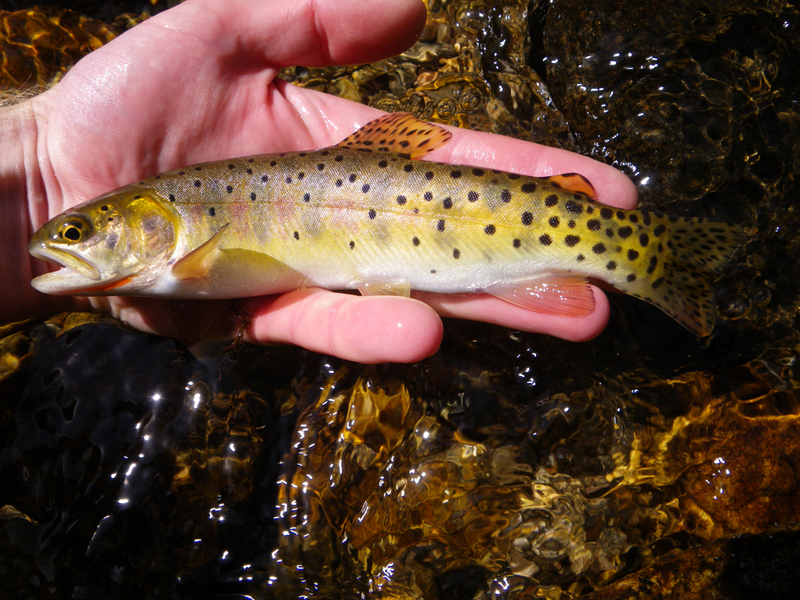 These cutthroat are known for having the largest and most pronounced spots of any of the other cutthroat subspecies and their spots are generally round or oblong shaped and are primarily concentrated on the caudal peduncle (Trotter 2008). Like their name suggests greenbacks exhibit orange to reddish colored cutthroat marks under their lower jaw and stream resident fish will often retain their parr marks into maturity. A map of the original native range of the Greenback Cutthroat trout. Data Source: Behnke (2002) and Trotter (2008).